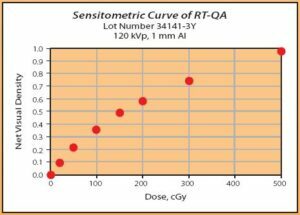 The film RTQA is designed for routine quality control systems easy and safe way to administer radiotherapy systems in any form. It takes place in real time. No need for postexposure. Size and shape depending on your needs, use only what you need. Very competitive prices compared to conventional film. Why use gafchromic film RTQA? – Only positions, radiates and looks. There is no need for dark room or the movie revealed. – Simple and accurate, if the light field is not aligned with the radiation field is immediately and adjusted. Eliminates unnecessary time for repetitive exposures, measures and adjustments. – Economic: cuts easily and use what you need. The response of the film is dependent RTQA specific factors such as energy spectrum of the radiation source, the characteristics of the densitometer, film scanner, and other measuring means, etc. Since the absolute RTQA film response can vary from batch to batch, the user should remeasure the answer when making a batch change. 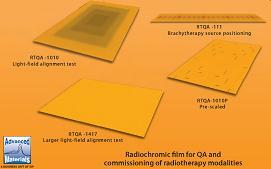 The film RTQA 111 (dimensions 1.25″x11″) It is designed to check the positioning of the sources in HDR. It is designed for use on mannequin or directly attached to the catheter. We mark the positions of the catheter with a pen and checked against the autoradiographic image marks. A key advantage of the strip RTQA 111 is the stability and alignment. Eliminates the worry of movement within and increases measurement accuracy. With a time of between 0,5 seconds 2 seconds depending on the source and, film RTQA 111 displays sharp images, where clearly the position of the fonts are displayed.